Experience the hustle and bustle of city living in Taiwan’s major city, Taipei. 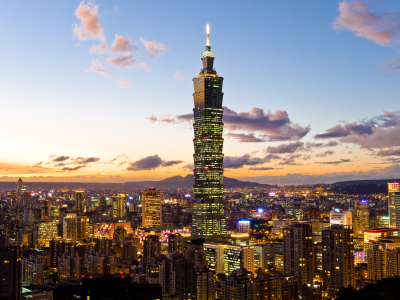 Home to the world’s second tallest building, Taipei is more than just a cosmopolitan city. Surrounded by the Danshui River on its western part and by the Xindian River on its southern side, Taipei boasts of its natural beauty that serves as backdrop to its modern skyscrapers. With its subtropical climate, Taipei experiences monsoon rains during the months of April until September. It is humid and hot in the summer, while temperatures can be as low as ten degree Celsius during winter. Expect tropical storms and heavy rains during the summer, though. Like any other city, Taipei has its own share of traffic, pollution, and chaos. But all these are part of the natural Chinese charm that the city is known for. Walk the streets of Taipei and experience a melting of the old culture and the modern technology. A good place to start your visit to the city is the Discovery Center of Taipei. Here you can see replicas and maps showing the history of Taipei from the 1882 walled city to present-day modern city. There is also a showcase of Taipei’s geography, natural resources, and its people. From the Discovery Center, you can explore more about Taipei’s rich heritage through the National Palace Museum. On display is a vast collection of Chinese art and culture, such as ceramic wares, jade pieces, statues, painting and calligraphy. It also showcases a large collection of Buddhist artifacts from the Forbidden City. Then move on to Jiufen and its old streets and experience life’s simplicity and joy. Learn of the place’s mining history and unique mining culture as you nibble on taro balls and the traditional herbal cakes. Temples in ornate designs abound in Taipei. The Longshan Temple in Wanhua District is a perfect example of southern Chinese architecture. Built like a square, the temple is adorned with exquisite sculptures of dragons on its different sides. While temples and shrines are common sights in Taipei, there is an area that has earned its name as “Road to Heaven” because of its places for worship. The Xinsheng South Road is lined up with different place of worship: from temples to shrines, and from churches to mosques. A visit to Taipei is not complete without a trip to Taipei 101, the city’s highest shopping center with a splendid view of the city and its neighboring area. On the 89th floor is the Indoor Observatory while on the 91st floor is the Outdoor Observatory. Both will give you 360-degree views of the city. Of course, one of the main features of Taipei 101 is its shopping mall that accommodates hundreds of trendy shops, high-end restaurants, and lively bars and clubs. You can find almost anything and everything in the tower’s shopping center. If you are one who enjoys haggling and the flea market adventure, there is always a place for you. Check out Taipei night markets. Taipei’s famous Shilin Night Market(士林夜市) is filled with stalls offering consumer goods, clothing and other fashion accessories. For a wide array of food, visit Nanya Night Market(南雅夜市) and Raohe Night Market(饒河街觀光夜市). Or you might visit Ximending, another popular area for shoppers, where you get a feel of the modern and the old through its historic buildings and modern structures. There is the historic cinema and concert hall and the chic fashion store and the trendy restaurants. Situated on the northeast of Taipei, Yangmingshan National Park is home to the Taiwan’s flora and fauna. There are more than a hundred species of butterfly living in its butterfly corridor and around twenty bird species flying around the area. You can catch a glimpse of emerald green muller’s barbet and Taiwan’s blue magpie. Surrounded by mountains, the national park has its own share of lush scenery, tropical rainforest, and beautiful flowers. Cherry blossoms blooming on spring is a sight to behold. If you are more adventurous and would enjoy a hike up to the mountain top, the national park has hiking trails that are well-maintained. After a hike up and down the mountains, bathe in sulfur hot springs dotting the Yangmingshan and relax and dine at the Lavander Garden or at the Shiyang Culture Restaurant.